Thousands of drivers who lie to their insurance firm have been caught out by a £58 million database that hands over motorist details to insurers and promises to “eliminate insurance fraud”. The Government began sharing details of 40 million licence-holders with firms 12 months ago including whether drivers have been caught speeding before, their age and postcode, and whether they have previously lied to insurers. Since the launch of the “MyLicence” database, part of a £58 million Government project to digitise driver details, firms have detected 18pc more incidences of motorists lying on car insurance applications in an attempt to get a cheaper premium. There were 212,000 attempted dishonest applications for motor insurance in 2014, according to the industry body, the Association of British Insurers (ABI). This is one fifth higher than in 2013, before the database was unveiled. This equates to just over 4,000 fraudulent applications found out every week. Common lies exposed by the licence-checking service, currently accessed by 100 insurers and comparison websites, include “forgetting” to come clean about previous claims or unspent convictions and giving a different postcode to their correct address. 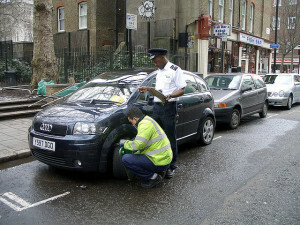 Previously, insurers would check individual driving records through the Driver & Vehicle Licensing Agency (DVLA), a government body, but this was expensive and time-consuming. Insurers instead relied on information from individual drivers when they filled out an application form. Industry data suggests 23pc of drivers fail to provide accurate records of their driving, whether intentionally or not. Out of all motorists, 16pc hide their previous convictions.